The Queensland branch of The Australian Hovercraft Federation held a planning meeting at the Silverline Insulation office at 12 Veronica Street Capalaba, on Tuesday, 16th February 2010. Des Goss, Phillip Audsley, Arthur Stead, Dale Baxter and Steven Odgaard. Cruise report - Muriel Street, Redland Bay, Saturday 13th February 2010. Peter Venn & Steven Odgaard - Turbo TP6 powered by a Subaru 1800 & Honda twin cylinder. Des Goss - Turbo Wedge 225 powered by a Robin EC44. Arthur Stead - Revtech Renegade powered by a 20hp Honda 2 cylinder. Dale Baxter - ASV Vortex powered by a Rotax 582. Phil Audsley our treasurer also attended, but did not bring a craft. Russ Pullen arrived at 12:15 pm to take photographs of the returning craft. With ideal bay conditions the fleet followed the TP6 north through the Redland Bay Channel then along Pannikin Island, then east to 'The W's' channel intersection and onto the south western end of Karragarra Island. We were met here by 5 gents strolling through the revegetated shoreline, one of whom had seen Peter operating north of Gladstone just 2 weeks previously. Steven boiled up the billy and we all had morning tea on a picnic table under the shade of the palms and tea trees. 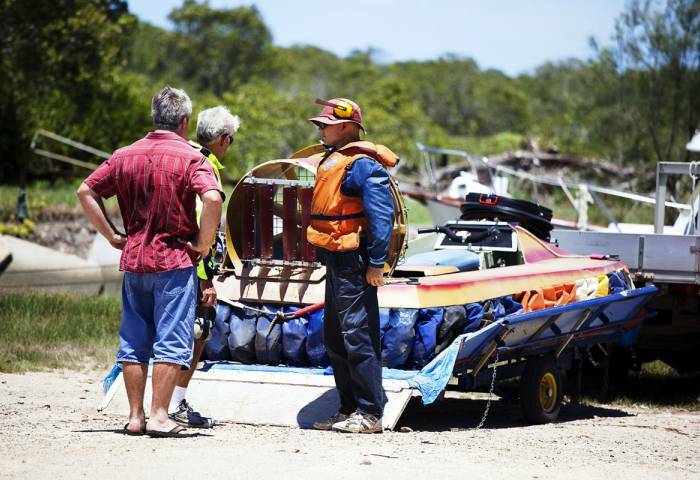 Peter explained that it was here on Karragarra that he had met a hovercraft owner who had ACV master ticket 001. Peter was always curious about this because his master's ticket, issued in 1977, is ACV-002. After returning to Redland Bay via the Garden Island Passage, Elaine once again provided lunch for everyone back at Number 96. 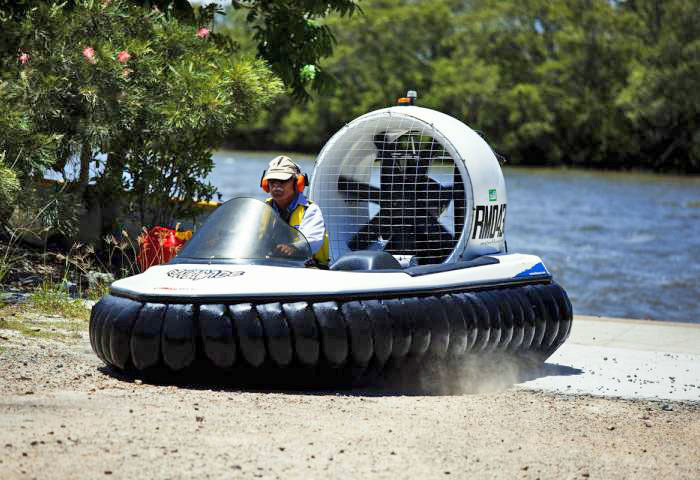 Preparations are now underway for an Australian challenge in Endurance Racing at the 2010 World Hovercraft Championships being held at Towcester in the UK during August. Two teams (Gold Team & Green Team) will compete under the banner 'OzTeam 2010 - THUNDER from DOWNUNDER' using 2 new racing machines currently being built for the challenge. 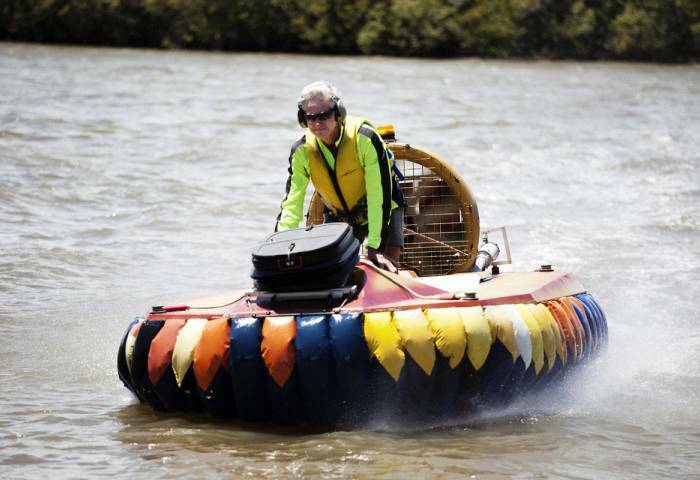 The Revtech Renegade is an Australian designed and built advanced technology personal hovercraft, featuring a state of the art kevlar epoxy composite hull and advanced technology propulsion system. The Er is a special version of the Renegade with a number of modifications including a supercharged liquid cooled engine, an improved propulsion system and an exhaust system tuned for improved noise suppression and efficiency. The next club cruise will be on Saturday, 13th March 2010 at Muriel St, Redland Bay - weather permitting. Meet at 9:00 am at Peter Venn's place at 96 Muriel St, Redland Bay for a launch into the Redland Bay Channel and a run amongst the southern bay islands. 7:30 pm - Tuesday, 16th March 2010. The next meeting will be held at the Silverline Insulation office at 12 Veronica Street, Capalaba. Access via Redland Bay Road and Smith St.
UBD Reference - Map 184 B17.